In the spirit of trying something new and practicing the "learning club" concept that we preach, this will be the first installation of our "Lake Map Challenge". 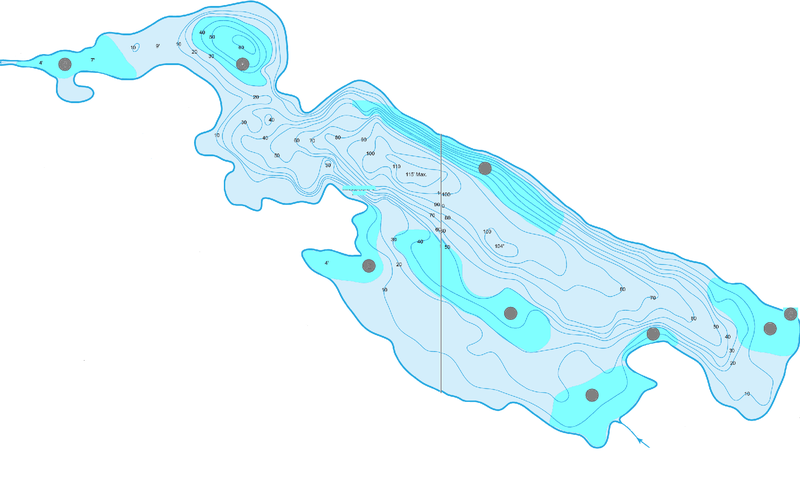 I'm going to provide a map of an un-named lake (ala the "Day On The Lake" challenge). Your challenge is to read the information provided, and based on how much or little you know, describe how you would approach this body of water for the first time. Some challenges will go as far as giving you exact weather conditions and time as year. Some will be purposely vague. The goal is an open discussion that forces us to think and strategize, and expose you to different thought processes. Hopefully this will promote better critical thinking and make us all better anglers who are not reliant on "spots" and specific pattens we like to fish. If anyone wants to submit a lake to the challenge and can provide me a "blacked out" map of the lake (so it remains a secret), please email me. Happy strategizing! Our first lake is a northern US natural lake. Coming in at just over 1,000 acres, this lake has extremely high visibility from ultra clear spring and creek water. I'm talking 25 feet down visibility, like Lake Michigan. Primary bottom structure is sand, rock and gravel, with some mud and muck located at the inlet and outlet creeks on either side of the lake. Millfoil clumps spot the lake in emergent and submergent bunches. Make no mistake, this is a smallie lake through and through. Largemouth are there, and they're big, but they're much more sparse than their smaller lipped brethren. There's a myriad of forage options, but your offerings better look natural. Let us know what your spring time approach would be! Lets Start with the smallies, The lake should be thawed by now and the water temp on the rise. The Smallie are gonna want to eat before they fully set in to spawn. I'd look for a rocky flat near a deep water get away close to a spawning flat in the 8 to 12 foot range on the north side of the lake where the warm southern winds are hitting the bank. Early morning when the sun is just moving over head, I'd pick up a spinning rod with no more than a 8 lbs Fluorocarbon leader tied to 15 lbs spiderwire and a 1/16oz tube jig covered up with a green pumpkin tube. Before throwing the tube I'd make a hand full of cast with a suspending jerk bait to try an wake em up a bit. then pick up the tube and slow drag it along the bottom and wait for the smallest little thug. The Large mouth, they are going to be looking for warmer water and food (bait fish), in the back of cuts Near a point with deeper water close by, Like the mid lake curve and point on the left side. I'd Start out on the point and throw a suspending jerk bait first and see if there out deeper waiting to move up when that sun fully hits the shallow waters. If no takers, pick up a jig and get it on the bottom and slow crawl it back looking for that one fish to give up their location, Work the water column deep to shallow. In the deeper water they most likely will be suspending as they move shallow to feed they should get more aggressive in eating, But keep it slow there still cold. Following someone doesn't mean they know were the Fish are!! Assuming no practice day to look around I see three spots where I would choose to start. I would fish the first 6 hours for smallmouth and save the last two hours for a Kicker largemouth to complete my limit. I would study the day time and night time air temp for the past week in the area. As soon as I launched my boat I would take the water temp and then proceed to my first spot. If I'm the 1st boat out, I would put it on plane and go to the Northwest corner of the lake until I hit the three foot range. I would idle up the river/creek as far as I could looking at the shore, the current, rocks, wood etc. I would primarily throw a small green pumpkin jig with a speed craw trailer. But I would start with a purple or white Dan Gapen Ugly Bug. When the water temp is warmer than the air temp, I would crawl the bug with current until I got a smallmouth pickup. If the water is a lot colder than the air I would dead stick a bit especially if I could find some creek turns, docks or other current breaks. If I found the area promising I would stay two hours. If I found the area not attractive, I would leave as soon as possible. Next I would try the southwest tuck and look for shallow water that looked fishy. I don't really like this spot on the map as much as I want to but I would take a look just so I wasn't kicking myself on the drive home. In both of these first two spots I would throw a huge Colorado or Kansas bladed spinner bait ( black or white) along wood for large mouth. Just a few casts though. If I don't have what I'm looking for by the third hour. I would go back to the North shoreline with the deep breaks. HOUR 3 THROUGH 6 I'M CONCENTRATING ON SMALLIES. I don't see the humps that I'm looking for on the map, but I would look for them on my locator. I'd throw that Ugly bug spinner all along the North shore. I'd throw a 6-8 foot running Citris Shad crank and if there were some small points I'd follow up with an American shad 3 inch Pointer jerkbait. In addition to the smallmouth jig I'd add a 4 inch green pumpkin Lake Fork baby ring. If I find rock piles like Lake Geneva or Lake Winnebago I am swimming an IGS green pumpkin salt garlic tube on 3/16 to 1/2 ounce swim jigs and/ or round heads. If I find sand and I can see the smallies spawning, game over. I'll let my tube rot in a big bed until she picks it up. If I'M on huge bedding smallies, game over. I'll abandon my largemouth plan for the end of the day and just fish in the best largemouth spot near the ramp for the last 15 minutes. If you could fish in just one state for the rest of your life, where would it be?